The largest size in this range is the promotional Mini Solid Easter Eggs 50 gram bag. 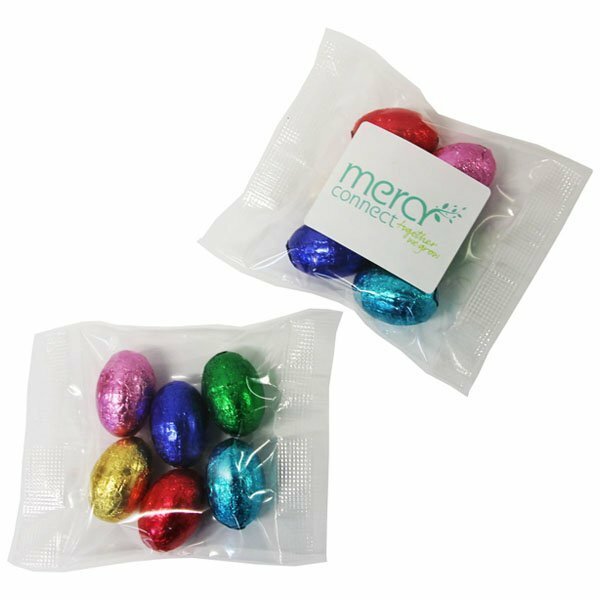 Check out the custom Mini Solid Easter Eggs 50 gram Bag and see how a simple idea can turn any Easter event into a promotional wonder. If you’re looking for a gift product that will market your business during this season, then this promotional gift product is definitely the one for you. They’re good looking, delicious, and for your advertising, they’re great tools that will get the word out about your business. 50 grams of confectionery goodness is great to share with friends and coworkers. They also make great treats for the kids at home. These solid Easter eggs really take promotional candies to the next level with their excellent taste. But not only do they taste great, we’ve also made sure that they’ll also arouse excitement for the coming season. To do that, we’ve wrapped them in fun coloured foils. These foils are not only fun to look at, but they also make unraveling the chocolates inside quite an engaging experience. The bags can be further personalised to have your printed logo for your maximum advertising exposure. You should also know that it doesn’t have to be Easter for the custom Mini Solid Easter Eggs 50 gram Bag to be effective as these confectioneries will show off their charm in any given occasion. If you think you like the Mini Solid Easter Eggs 50 gram Bag, also do check out the promotional Mini Solid Easter Eggs 15 gram Pillow Pack and the personalised Mini Solid Easter Eggs White Noodle Box for other options. You should also take a look at our custom embroidered Peruvian Beanie if you’d like to get ideas about our wearable promotional products. If you’d like to learn more about our products, do give us a call via 1300 008 300, or send us a chat message. Likewise, you can send us an email.